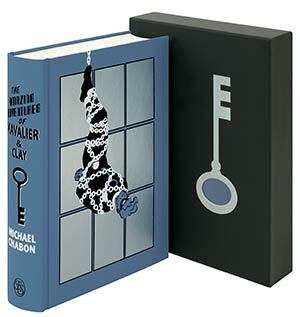 The Folio Society, publishers of beautiful illustrated editions of the world’s greatest books (see our book reviews for a sample of their many great titles), has teamed up with comic book illustrator Chris Samnee to bring his style to Michael Chabon’s Pulitzer Prize winning cult novel The Amazing Adventures of Kavalier & Clay. Delivering all the thrills of golden age comics and a deeply humane story about hope and tragedy – all via an exuberant literary voice – it has become one of the defining novels of the modern age. With the Chabon’s approval, The Folio Society teamed with Eisner award-winning artist Chris Samnee to take on the world of the Escapist in the first-ever illustrated version of this literary work. His work on iconic heroes such as Thor, Spider-man, Batman and Daredevil, allows Samnee convincingly to portray the smoky, frantic world of the comic book studio with 10 colour illustrations including seven double-page spreads, and a blocked and die-cut slipcase. Michael Chabon’s pre-war New York is a place of optimism and art, of big band music and sharp suits. In his hands the city becomes a transformative place, taking lost souls and making them Americans; taking broken children and making them superheroes. By intertwining the stories of two Jewish boys with that of their liberty-inspired comic hero, Chabon tells not only the story of a fledgling art form, but that of America itself, as seen through the eyes of its immigrants. The Amazing Adventures of Kavalier & Clay by Michael Chabon, illustrated by Chris Samnee with colouring by Matthew Wilson, and with an introduction by Michael Moorcock, is available exclusively from The Folio Society.